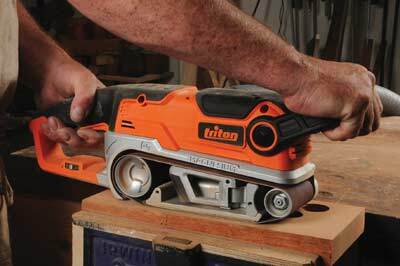 Triton Tools from Australia have seen a change in their fortunes since the company changed hands a while ago. We are seeing the launch of an ever-wider range of tools to challenge competitors. With their bright orange and shiny magnesium livery, they look set to stay. 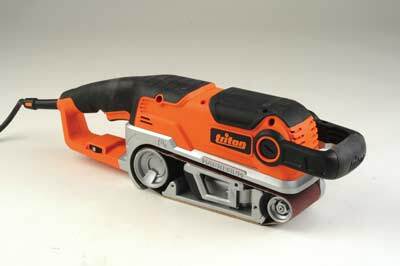 We fancied trying out the TA1200BS belt sander, a funky, heavy-built piece of kit. It is long and solid with a tough plastic upper casing and rubber overmoulds on all grip surfaces. The lower body is spray-finished magnesium, chosen for strength and lightness, apparently. A large loop lever is used to easily slacken off the belt for changing, while a rubber-covered knob on the side is used to adjust the tracking. At the rear is the switch trigger with an on-lock for continuous working - it favours right handers, but me being a leftie, I still managed to press it on perfectly well with the side of my hand. Just below is a six-stage speed wheel, while on the opposite side is the narrow dust outlet which takes either the included dustbag or an extraction spout with a narrow adaptor. The toothed drive belt hides under a removable cover and a spare is included in the box. The front handle has a snap-down lever to unlock it and the handle tilted up or down to suit - in the downward direction a little force is required. On one side of the machine are two threaded holes and cast guides which I think must be for their soon-to-arrive sanding frame - useful to stop this narrow gauge belt digging into your work. The Triton was pretty well behaved. The tracking kept the belt in place. There was plenty of power and start up was fast but not sudden. The small front roller allows reasonably close working to vertical surfaces. Dust extraction worked OK but not perfectly. In short, not bad at all.